The Eurovox EX8000 HD+ from a newcomer to satellite is compatible with digital terrestrial (DVB-T), and both variants of digital satellite (DVB-S and DVB-S2 for HD). It's PVR-upgradable if you've an external USB hard drive to hand, and supports playback of some multimedia file types. For pay-TV services it boasts a card reader for use with firmwares that can emulate CAMs, plus two CI slots for any hardware CAMs you might have. But the PVR upgradability is scuppered by the lack of independent tuners; you can't record a DTT channel while viewing a satellite one, or vice versa. Eurovox is working on this. It's smart-looking, with a glossy front reminiscent of some Samsung products. A couple of prominent control discs are provided for menu control – these will also adjust volume and step through channels. We're impressed with the 12-character fluorescent display with channel name, basic menu information, various status icons and a standby clock. But it can't be dimmed or extinguished; the 'front display setting' options menu described in the manual was not present in our review model's firmware. The right-hand section of the front panel hides a convenient USB terminal, the CI slots and a single card-reader (you can be forgiven for believing that there are two, but the lower slot is sealed off ). The rear panel is a cornucopia of connectivity. 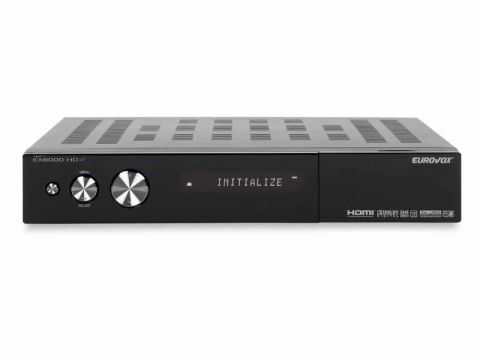 Both the satellite and terrestrial tuner have a loopthrough output as well as an input, although the EX8000 lacks the UHF modulator of the Technomate TM6900 HD Combo Super – to which this receiver is otherwise similar. You also get VCR and (RGB-compatible) Scarts, composite and S-video outputs. For hi-def video we're served by both component and HDMI. These will go from 576i (standard def, interlaced) to 1080i. If you have a DVD recorder you can have the RGB Scart output active at the same time as the HDMI port, even if the latter is in hi-def mode. Note that component and RGB Scart are not allowed simultaneously. Next we have eSATA and USB ports for external storage devices and PVR use, plus an Ethernet port that has yet to be harnessed. The final connections are a RS232 serial port, analogue stereo and optical digital audio outputs. The EX8000 is easy to install. The installation menu's 'dish setting' option allows you to specify the satellites you can receive. For each, DiSEqC – 1.0/1.1 or motorised (1.2 or USALS) – can be turned on or off . If you've specified the latter then a further motorised setting menu is available. From here, you can move the dish continuously or in steps, change satellite/transponder or save position. You can initiate a basic auto-scan from the dish-setting menu, but more options are available from the installation menu's associated 'channel-search' option. The searching options featured include full auto-scan, manual-scan of a single transponder, PID scan or blind search. For each mode you can tell the EX8000 if you're after free-to-air and/or encrypted channels. As searching proceeds the found channels are listed against the background of a skyscape with cutesy animated-dish icon. Multiple satellite searches can also be conducted, the birds you're after being selected from a list. For DTT channels the tuner is treated as a 'satellite' and when you choose this one in the channel search menu it changes to the relevant parameters (search the entire band or a single multiplex, bandwidth and so on). Other menus look after conditional access hardware, channel management (deleting, moving or renaming channels plus favourites lists) and system (parental locks, AV output, Ethernet and for some odd reason manual timer programming). Then there's the 'utils' menu that lists multimedia playback, games, a calendar, a calculator able to work in hexadecimal and – key to PVR use – a 'management' option dealing with discs and formatting. The first time we plugged in an external HDD (which must be FAT32-formatted) we could play compatible multimedia content but not record programmes. This required us to access the 'utils' menu's 'management' option whose disc check option can create a 'records' folder. The channel list can be sorted in various ways. All available channels can be displayed or they can be grouped alphabetically, by transponder or according to encryption status. Unusually, the latter categorises channels by CAM type. Although hi-def channels are flagged in the channel list, we would have liked the ability to carry out an HDTV-exclusive sort. Still, it has 32 favourites categories (16 for radio, 16 for TV) to choose from so you can easily create one for HDTV channels. These categories are displayed onscreen, along with available satellites (plus 'terrestrial' and 'all channels') by pressing the handset's 'group' button. On selecting the desired one, the channel list then changes accordingly. The EPG, which can be used to program the 8-event timer directly, supports now-and-next and seven-day schedules but the receiver isn't (yet) compatible with the Freesat EPG (although it will tune into the supposedly Freesat exclusive ITV HD). It has a list mode (which focuses on one channel) and a grid mode (to compare the offerings of up to five adjacent channels). The EX8000's EPG gives seven days' listings for DTT channels. Gimmick-lovers might appreciate the mosaic facility that grabs and periodically refreshes stills from two, four, six or nine adjacent channels. There's a three-step picture zoom, and you can also 'freeze' the current channel at the touch of a button. Plugging an external HDD into the EX8000 bestows upon it basic PVR functionality and that includes timeshifting. Once set up correctly, pressing pause arrests the current channel and starts buffering it to the HDD. You can then resume playback at your convenience and enjoy trick modes such as frame advance, slow-mo and cue/review at speeds of up to 32x. The buffer is retained on the hard drive until the feature is used again, thereby wiping the previous recording. You can't access this previously recorded buffer for playback from the EX8000, but you can if you take the HDD to a PC. The timer can be programmed directly from the EPG or by entering the stop/start time and channel – manual recording is also allowed (there's no OTR facility). Although it's not yet possible to record one channel while viewing another, even if the channels in question share the same transponder, you can play existing recordings while recording. The handset's file button presents you with a list of recordings – video from the currently highlighted one plays in a window, beneath which are details like time/date, duration and file size. Thanks to a time bar, it's easy to skip quickly through recordings (or, for that matter, timeshift buffers) in either direction. Recordings are stored in individual folders and split to get around the file size limitations of the FAT32 file format. The MPEG video and audio of SD programmes can be extracted using software like the freeware ProjectX. The use of ProjectX confirmed our suspicions that teletext data and DVB subtitles are not recorded – although alternative soundtracks are. And although radio programmes can be captured to disc they can't be played back! Yet if the recordings are transferred to a PC they can. We hope this bug will be fixed. Plug in a storage device containing MP3 audio files or JPEG still images and the EX8000 will recognise them. Indeed, a HDD's capacity can be shared between such content and PVR duties. Unfortunately, multi-megapixel JPEG images are shown in nothing better than upscaled standard-def on a hi-def TV – and that means they're robbed of their natural detail. Not only is the EX8000 one of the speediest receivers we've seen in terms of searching, but the selection of menus, channels and recordings alike are also fast. Picture quality is also excellent. The recent broadcasts of Swarm, Survivors and President Obama's inauguration on the BBC HD channel looked absolutely superb, with detail and colour fidelity both in the 'so-real-you-could touch- it' class. Also faring well was the Southend vs Chelsea third-round FA Cup replay on ITV HD; so strong was the detail that you could make out blades of grass. The quality of HD pictures serves to highlight how poor some of the standard-def transmissions are. This was demonstrated by switching to the ITV1 simulcast of the same match. Here, the picture was notably softer and more artefact-prone. Higher-quality channels (like the BBC's and some of the German ones on Astra 1x) fared better, although upscaling cannot add detail that isn't there in the first place. But when conveyed via RGB Scart to a standard widescreen CRT set such pictures are more than acceptable and are at least equal to dedicated SD receivers and PVRs. Sound quality, whether experienced via the digital or analogue audio outputs, is of a uniformly high standard. There's much to like about this receiver and it was refreshing to test a product that didn't require umpteen firmware revisions to deliver what was claimed by its supplier. There are shortcomings, but these are minor and most could be fixed through firmware. It's a pity that the Ethernet port is as yet unused – all you can do now is connect it to your home network and give it an IP address. The supplier, Rayyonics, tells us that Ethernet-downloadable firmware updates are forthcoming which, hopefully, will add features like remote access to recordings, networked multimedia playback and a web interface. The fluorescent display tube has unused 'Tu1' and 'Tu2' icons alluding to the fact that twin-tuner models are in the offing later this year. We await them with interest.